Hello has Santa been to visit? I hope he did and I hope he got you everything you wished for. I also hope you had a wonderful time we certainly did, it was lovely to be able to have a few lay ins and watch telly, read a bit and even craft. I managed to complete a few projects for the future Stamp With Us online classes( the next round starts at the end of January woohooo!!) and redo a swap that Royal Mail managed to loose before Christmas ( although it might still get there). What I am swapping you might ask? well as you know January is round the corner and with that so is the biggest sale campaign that SU is offering every year, you probably guessed it by now or indeed seen it advertised is SALEABRATION time. Now Saleabration means one thing and one thing only FREE STAMPS ...swoon, and you just wait till you see them, I am in love and cannot wait for tomorrow to come so that I can place my order and earn some for FREE. Below there s a little info on how you can qualify. AS A CUSTOMER- For every £45 you spend you will get ONE FREE STAMP SET of your choice( there are 4 different ones to choose from), you spend £90 and get two free sets and so on. 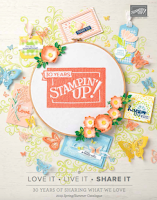 AS A HOSTESS- Host a workshop with totalling sales of £300 or more and receive a FREE stamp set!!! AS A DEMONSTRATOR- Sign up and become a demonstrator during Sale A Bration and receive an extra FREE set of your choice from the main catalogue (up to the £38.95 value). And if you do decide to start your own business and join my team of fabulous Passionettes, do get in touch with me to find out my SPECIAL SIGN UP DEAL I have running for the entire Saleabration period 30Dec 2009 -28 February 2010. 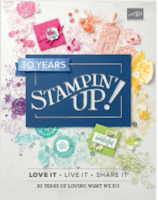 As you can see this is a fabulous time for anyone with Stampin'Up! And this is not all. As you know I like to do a special Offer for all of those who can't wait to get their hands on the new stamps. Place an order of £45 or more with me between today and 5th January 2010 by 10pm and get not only one Free SAB sets of your choice but be in with a chance to win one of those fabulous prizes. For each 11 orders placed with me the following prizes will be up for grabs. You loved my last draw and this time will be no different, join in the odds are FABULOUS, out of 11 people 6 will get an extra prize on top of your free stamp set, this really is a GREAT DEAL. What do you think? Tempted? if you are, and lets face it how can you not be all you have to do is send me your order at telemech01@aol.com before 5 January at 10pm. I will choose the winners via a recorded video, you get to see your name going into the draw then one by one the names will be pulled out. The winners will be notified by email on the 6th of January. Good luck !!! Here's a sweet sample I have made for one the swaps I mentioned earlier. 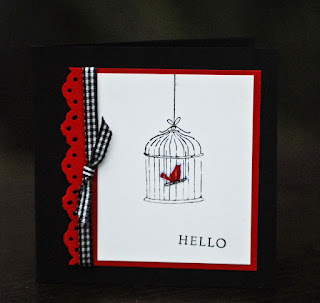 It is from the wonderful set Happy Moments and I simply adore this little birdcage stamp. Isn't it sweet? I kept it very simple and used a stricking clasic combo. Real red Basic Black and Whisper White with a bit of black gingham. Now before you look to close can I just say that this one didn't make it into the swap, I didn't used my SAMJ so my stamped sentiment isn't straight, needless to say I will keep this one for myself LOL. If you want to see the rest of the sets on offer please go here. In order to qualify for the saleabration promotion.....do I order from the regular catty or have I completely overlooked the occassions mini catty on your blog? Love this card. I have CASED your idea and added a little hanger and tie too - if you have time pop and look what I did with some of the wonderful sale-a-bration images.